depending on the number of pool sessions you utilize. On-line / Home Study Materials – $150 The full on-line educational program includes a very professional text/video presentation of scuba academics, an electronic personal dive log, and electronic certification tracking, all immediately accessible by both your PC and any mobile devices you may have. Pool training – $80 per pool session, and you’ll need 4 to 6 of these. These sessions are completed under the patient, watchful direction of our instructors, in our own clean, clear 87-degree pool. If you are learning with your family or in a small group of friends, this cost will drop, depending on the number of people in your class. Certification dives – $200 . This is a series of 5 or 6 dives completed over two consecutive days. 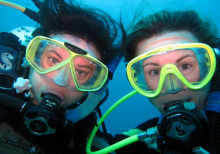 We provide the instruction, all scuba equipment, and certification processing. your SCUBA pool and certification dive costs are free! Very Important note: “So what happens if I pay all this money and start this training and then decide I don’t like it?”, you wonder… GLAD you asked! If at any time, for any reason or no reason at all, you decide you do not wish to continue your scuba training with us, we will refund ALL of the monies you have spent with us. Further, when you choose to purchase your personal snorkeling system through us, you have the same protection. You may return this equipment for a full refund, or exchange it for equipment you later find to be better fitting, for up to 30 days AFTER the completion of your scuba course. We will work hard to earn your trust. We want you to be a customer for life. To us, the amazing adventures found in diving are priceless… We have a third of a century of evidence compiled to prove this rather bold statement. It’s important to understand that Scuba is ultimately an equipment-intensive, adrenalin-producing adventure. To do it right, you need top quality equipment and thorough training. To stay safe, you need the same thing.If you’re looking for the least expensive scuba course in the area, our program is not for you. If you are looking for the best return on the money you invest in learning to dive, we’re willing to make that guarantee. Ask any divers you know about us. We’ll stand by whatever they say.